What Day Of The Week Was May 1, 1974? 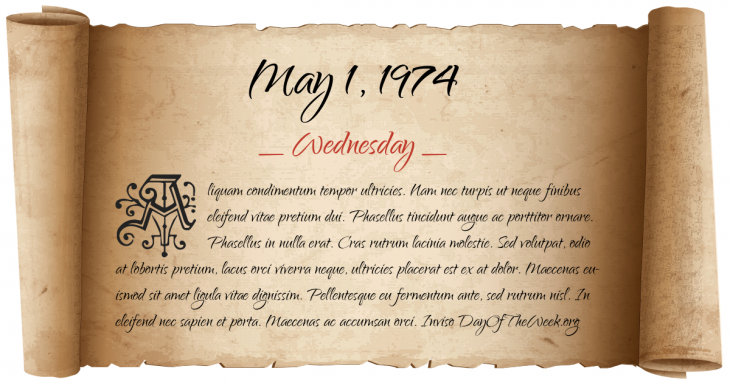 May 1, 1974 was the 121st day of the year 1974 in the Gregorian calendar. There were 244 days remaining until the end of the year. The day of the week was Wednesday. If you are trying to learn Spanish then this day of the week in Spanish is miércoles. A person born on this day will be 44 years old today. If that same person saved a Quarter every day starting at age 4, then by now that person has accumulated $3,741.50 today. Here’s the May 1974 calendar. You can also browse the full year monthly 1974 calendar. Taurus is the zodiac sign of a person born on this day. Emerald is the modern birthstone for this month. Sapphire is the mystical birthstone from Tibetan origin that dates back over a thousand years. Tiger is the mythical animal and Wood is the element for a person born on this day if we consider the very old art of Chinese astrology (or Chinese zodiac). The Argentine terrorist organization Montoneros is expulsed from Plaza de Mayo by president Juan Perón. Who was born on May 1, 1974?